Man To Man (also known as Man2Man & MAN 2 MAN) were a Hi-NRG band from New York City that formed in the early 1980s. They were best known for their hit singles "Male Stripper", "Energy Is Eurobeat" and "I Need A Man". 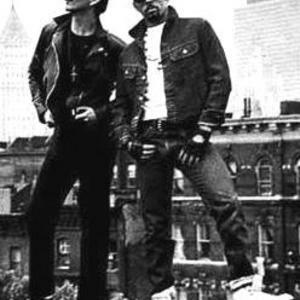 The act was composed of brothers Mikki and Paul Zone, who had been known on the local Brooklyn music scene since the mid 1970s. Paul participated in a band called The Fast during this period, with songs such as "Boys Will Be Boys"; the group gained some national attention with a second album being produced by Ric Ocasek of The Cars. After The Fast, the brothers spent the first half of the 1980s singing on a number of Hi-NRG and disco records for producers such as Bobby Orlando (records like Divine's "Native Love" and The Flirts' "Passion"). Soon after they formed a new band, which was originally called Man's Favourite Sports. However, another band had already claimed the right to use this name, so the Zone brothers became known as Man 2 Man. Under this name the band scored their biggest hit, "Male Stripper", teaming up with cult electro producer Man Parrish. Originally released in the United Kingdom in 1986 on the Bolts Records label, "Male Stripper" was a big club hit throughout the autumn and peaked at #64 on the UK Singles Chart. In early 1987, "Male Stripper" charted again in the UK, and this time the song became an even bigger hit, spending five weeks in the Top 10 and two weeks at #4 on the UK Singles Chart. Unfortunately, this success was never seen by group member Mikki, who had died of spinal meningitis on December 31, 1986. Due to the death of Mikki, Paul Zone decided to rename the act Man to Man and recorded a follow-up single. The record was a cover version of the Grace Jones hit "I Need A Man", which charted at number 43 on the UK charts. Paul continued recording under this name into the 1990s, working with producers such as Jacques Morali. "I'll Try Anything Once" was released in 2008 on iTunes and features vocals by Debbie Harry of Blondie.